The wall-to-wall vanity provides ample storage for both spouses— each has his and her own set of wide drawers, with a common space in the center below the sink. This couple decided on a large trough sink instead of two individual sinks; this gave them more counter space. The wall-mounted faucet keeps the countertop clear. We installed lighting below the floating vanity, used for accent, but also as a night light. The custom-made cabinet is made of cherry wood, with the grain running horizontally. To break up all the angles, I purposely chose a large round mirror. The client chose the gorgeous hand-made ceramic tile from Heath Ceramics. I opted to run the subway tile vertically rather than horizontally to break up all the horizontal lines, and also to draw the eye up to the skylight in the ceiling. The entire bathroom floor and shower wall are tiled in wood-look porcelain, giving the illusion of more space. The brown of the wood plank tile also balances the brown color on the other side of the bathroom. I really love the high contrast of the teal with the brown. The large ceiling-mounted rain shower head, along with the hand-held shower head are pure luxury. And please note that we intentionally placed the valve on the right side wall, which is the entry point of the shower— that way, the clients only need to reach in to turn on the water instead of walk all the way into the shower. The two recessed niches provide storage, but also looks like modern art to me, with the juxtaposition of opposing colors, lines and shapes. The clear glass shower walls allow all the colors to be viewed with no obstructions. Three colors— warm brown, vibrant teal, and crisp white are combined throughout. I was aiming for planes of color, again with a nod to modern art. 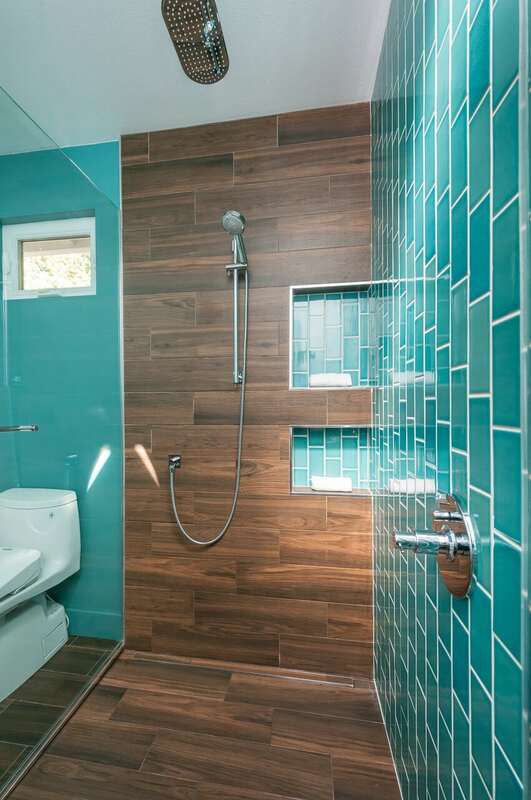 I selected a matching teal paint color to use on the wall behind the toilet to continue the color from the tile, but all the other walls and ceiling are bright white like the countertop. The result is a roomy, colorful, modern, stunning bath for two. I only wish it was my own bathroom! 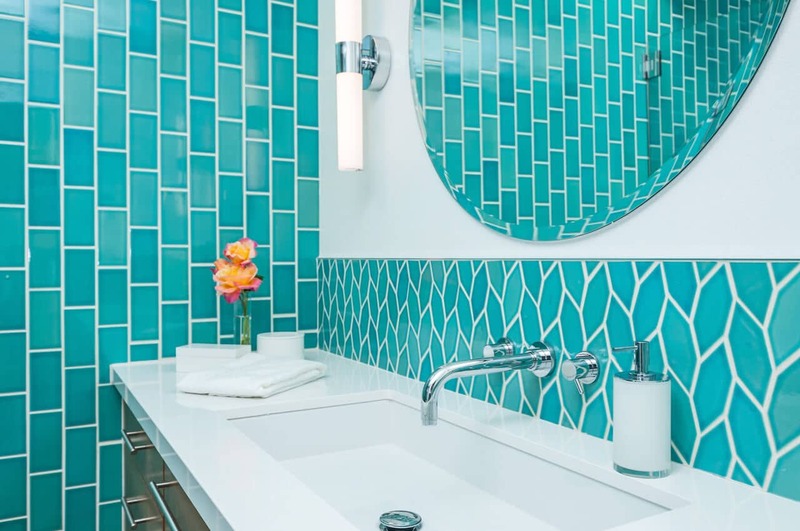 This bath project was a pleasure to design— it’s a spectacular blend of form and function, delivered with a punch of vibrant color, and an interesting mix of textures. I work with and appreciate all design styles, but my favorite style is modern. I love the clean lines and simple, minimalistic aesthetic. 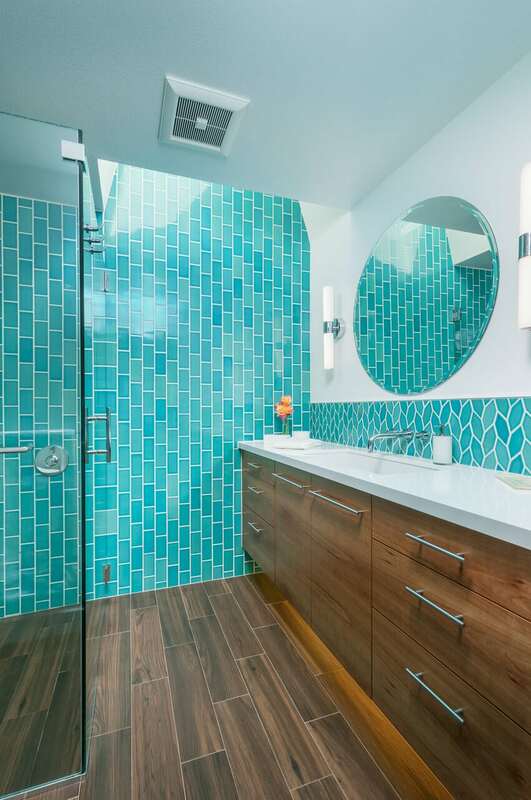 Modern design allows the freedom to combine colors and materials like these— hand-maid glossy ceramic tiles in vibrant teal, wood-look porcelain in warm brown, and stark white quartz. 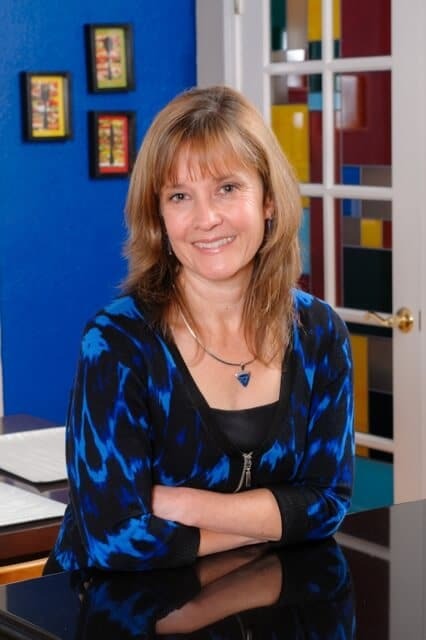 The client chose the gorgeous hand-made ceramic tile from Heath Ceramics. I opted to run the subway tile vertically rather than horizontally to break up all the horizontal lines, and also to draw the eye up to the skylight in the ceiling. The entire bathroom floor and shower wall are tiled in wood-look porcelain, giving the illusion of more space. The brown of the wood plank tile also balances the brown color on the other side of the bathroom. I really love the high contrast of the teal with the brown. Three colors— warm brown, vibrant teal, and crisp white are combined throughout. I was aiming for planes of color, again with a nod to modern art. 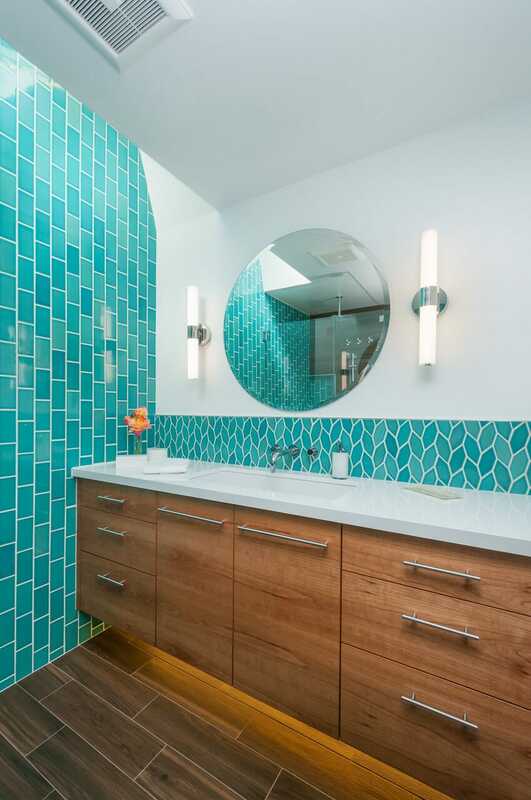 I selected a matching teal paint color to use on the wall behind the toilet to continue the color from the tile, but all the other walls and ceiling are bright white like the countertop. The result is a roomy, colorful, modern, stunning bath for two. I only wish it was my own bathroom!